In 1972 I was a 20-year-old psychology major at Norfolk State University, a historically black institution in Virginia. One day a visiting white South African lecturer came to campus. In his speech, he referred to the lesser capabilities of "our blacks"--meaning black South Africans-- compared to U.S. blacks. I still remember the students' anger. One of us challenged the visitor by asking him what he meant by "our blacks." Was he suggesting some kind of ownership? The lecturer, visibly perturbed by our contempt, tried to forge ahead. But it got worse. He launched into an explanation of the physical characteristics of some black South African women, the so-called Hottentots (the term is a derogatory reference to the Khoikhoi people driven into the Kalahari Desert by the first wave of white settlers). According to the lecturer, these women were able to weather periods of privation and scarcity by storing fat in their buttocks! We didn't riot; we simply tuned him out. As far as we were concerned, he had nothing to say that we needed to hear. While few of us could have spoken in depth about South Africa and the situation there, we were familiar enough with racism to know a racist when we heard one. The South African's disturbing visit was an important moment for me because it demonstrated both my ignorance about Africa and my lack of political sophistication. The Vietnam War and the draft of young men like me was another indicator that I needed to become more politically engaged. Some of my high school classmates, who had either been drafted or had volunteered for military service, had returned home in body bags, forcing me to think about their senseless deaths. I vowed never to participate in a war unless I was fighting for something I believed in, something for which I was willing to die. I still hadn't connected Vietnam to South Africa, though, or the situation in either of those places to the one at home. At Norfolk State we were more concerned with the racism we encountered each day than with racism 4,000 or 5,000 miles away. It wasn't until I began graduate study at the much larger Ohio State University in 1973 that the relationship between Southern Africa and the United States became clear to me. That was partly because there were many foreign students on campus, and a substantial number of them were from nations in Southern Africa. At Ohio State, where I was a member of the All- African Student and Faculty Union (AASFU) and co- editor of its monthly newspaper, Our Choking Times, my consciousness and activism increased. In AASFU I participated in heated political debates about competing liberation groups in South Africa, Angola, and Zimbabwe. And since this was the era of Black Power, black students like me also debated what allying with the white Left in the United States might mean. As our sense of the world we lived in developed, we began to see that local cops or sheriff 's departments weren't all we had to confront. Challenging the U.S. government seemed an increasingly important task that those of us trying to support Southern African liberation movements would have to shoulder. The giant multinational corporations we were being educated to serve seemed a dominant force in Southern Africa, maintaining the status quo. Support for Southern African liberation meant we would have to challenge them. South Africa, where many U.S. corporations were concentrated, took on special importance. Given South Africa's powerful political and economic role in the region, we knew that if African revolutionary movements were successful and the apartheid nation fell, black majority rule would become a reality throughout Southern Africa. We also recognized South Africa's role as a regional terrorist that attacked and destabilized independent African nations in an attempt to guarantee its own security. It was a great learning period for me and for others like me. We had first been influenced by black radical organizations, notably the Black Panthers and the All-African People's Revolutionary Party. These had succeeded groups like the NAACP, CORE, SNCC, and the Southern Christian Leadership Conference (SCLC), which had largely focused on civil rights in the U.S. South. Although we didn't make the connection until later, during the 1960s civil rights activists like SNCC's James Forman had already recognized a relationship between the oppression of blacks in the United States and in Southern Africa. Indeed, the "one man one vote" slogan SNCC had used for its Southern voter registration campaign was borrowed from Zambia's independence struggle. By the 1970s SNCC no longer existed, and CORE changed for the worse under new leadership. The NAACP was still focused on its decades-old approach to civil rights, and the SCLC had declined after the assassination of King. But militant and thoughtful activists who had been shaped by these organizations remained active, forming a kind of loose political network or set of interconnecting networks. Activist and scholar Geri Augusto, who took part in protests on the Howard University campus in the late 1960s, recalls these networks as complex and multigenerational. Her mother and father had been active with CORE and SNCC in Dayton, Ohio. Augusto herself became involved with the DC-based Center for Black Education, an independent school and community education center. Later, while living in Angola, she was one of the key contacts in Africa for the Southern Africa Support Project (SASP) of Washington, DC. Augusto emphasizes the myriad interconnections between activists, individuals as well as groups. At the Center for Black Education, she recalls, there were old SNCC people, a few people who had been involved in the student strike at San Francisco State, and others with links to the Black Panthers or to black nationalist Maulana Ron Karenga's U.S. organization. This whole thing is a story of networks and nodes and density and connections. I think complexity theory is probably a good frame for looking at how black activists got created and how they got hooked into other nodes and sets of institutions and activities across the country. A quick summary of complexity theory is many agents interacting in a field or a system or a space. Each one has its own logic, its own culture, its own interests, but for whatever reason, it has, from time to time, to interact with any number of others. And then they come to share certain kinds of things, like you might share a set of ideas or beliefs. Or you might come together from time to time to work on a purpose, like all of us came together for that first African Liberation Day. We [all] came together where there was mutual interest. If the roots of the anti-apartheid movement were planted in earlier decades, the 1970s was the decade in which those roots began to grow, shaping the course of the movement in the 1980s and into the 1990s. In my own case, involvement with African liberation pushed me away from my own uncritical politics into a more disciplined analysis and approach to struggle. By the end of the 1970s I had left Ohio State for Howard University in Washington, DC. There I joined SASP, a stalwart in DC's black community, serving as its co-chair for several years. Many people representing a range of political positions were part of the 1970s anti-apartheid movement in the United States. But the movement was primarily shaped by activists who recognized the importance of local organizing and local strategies. In many cases these were designed to coincide with the national focus of organizations like the African Liberation Support Committee, AFSC, ACOA, the Washington Office on Africa, and, beginning in 1978, TransAfrica. Close attention was paid to the use of local, national, and international media. Veterans of the civil rights movement, in particular, brought useful skills and experiences to this phase of the movement. Frank Beeman was a key figure in the Southern Africa Liberation Committee, a small group founded in East Lansing, Michigan in 1972. He recalls that, for him, anti-apartheid work "just seemed to be a natural shift from the civil rights movement." Older organizations and their members, who had been involved with Africa far longer than our student generation had, helped connect us to groups in various communities around the country. The ACOA, in addition to Washington lobbying, also funded field programs, working in Chicago with Prexy Nesbitt and in New York, building bridges to the black activist communities in those cities. ACOA and other experienced activist groups brought sophisticated strategies and tactics to our attention. As early as 1966, for example, the National Council of Churches and its member churches began using their institutional power to challenge investment in South Africa. Although this was only a beginning, it pioneered the strategy of targeting individual corporations involved in South Africa. Another member of SASP, Mark Harrison, served as program director for the United Methodist Board of Church and Society and as human rights coordinator for Clergy and Laity Concerned. He remembers that in the religious community, "the growth of activity was uneven, and mostly unstructured except for the work of some key groups at the national level." Even so, he notes that the religious community led the way. "As early as 1976, before the divestment issue became nationally prominent, the Christian Church (Disciples of Christ) had adopted a strong resolution on divestment and on bank deposits by member congregations and agencies" (Harrison 1995). Church activism encouraged our own, and we in turn pressed church groups to become more active, despite the conservatism of some denominations. At the national level, labor unions were reluctant to join our effort because they maintained a strong anticommunist stance inherited from the Cold War. Yet the rank and file members in local branches often adopted a more militant anti-apartheid attitude than the leadership. At the local level, direct action was carried out by groups like the Dodge Revolutionary Union Movement and the League of Revolutionary Black Workers, both operating in the auto industry in Detroit. In Cambridge, Massachusetts, the Polaroid Revolutionary Workers Movement was formed for the express purpose of taking action on South Africa. In 1970, two black employees at the Polaroid Corporation in Cambridge, Ken Williams and Caroline Hunter, had discovered that Polaroid was selling its instant photo technology for use by the South African military and police. They organized the workers' movement, which demanded that Polaroid stop doing business in South Africa and turn over its South African profits to African liberation groups. Working with South African exile Chris Nteta, who was based in Boston, they gained not only local but international attention. They testified before the United Nations and at the House Africa Subcommittee in Washington. Polaroid responded with an "experiment," improving conditions for its black workers in South Africa. The experiment ended five years later when it was revealed that Polaroid's distributor was violating Polaroid's commitment not to sell directly to the South African government. 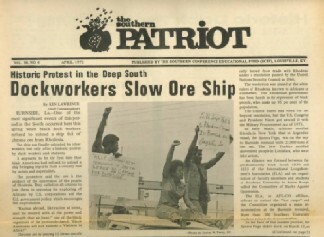 In 1972 black longshoremen, in an alliance with black students, held demonstrations at ports in Burnside, Louisiana, aimed at preventing ships from unloading Rhodesian chrome. Similar actions were held at ports in Baltimore, Boston, and Philadelphia. An emerging figure in the early part of the decade was Randall Robinson, a brilliant young student at Harvard Law School. In 1971 he teamed up with Chris Nteta, then a student at Harvard Divinity School, to form the Pan African Liberation Committee. Continued on pages 116-128. Order book.